Use a meat mallet to pound each butterflied chop to 1/4-inch thickness. Combine 2 tablespoons flour, salt and black pepper in shallow dish. Use fork to beat together egg and water in another shallow dish. Place bread crumbs in third shallow dish. Dip pork chop in the flour mixture, turning to coat. Dip in the egg mixture, turning to coat; dip in the bread crumbs, turning to coat. Lay coated pork chop on waxed paper. Repeat with remaining pork chops. For mushroom cream sauce, melt 1 tablespoon of the butter in medium saucepan over medium heat. Cook mushrooms and green onion in hot butter until tender. Stir together chicken broth and the 1 tablespoon flour in small bowl; stir into mushroom mixture in saucepan. Cook and stir until thickened and bubbly. Stir in heavy cream, 1/8 teaspoon black pepper, nutmeg and ground red pepper. Remove from heat; cover to keep warm. Melt another 1 tablespoon of butter in large skillet over medium heat. Cook 2 coated pork chops in hot butter for 3-4 minutes or until brown and tender, turning once. Remove to serving platter. Cover to keep warm. Add remaining 1 tablespoon butter to skillet. Cook remaining pork chops in hot butter for 3-4 minutes or until brown and tender, turning once. 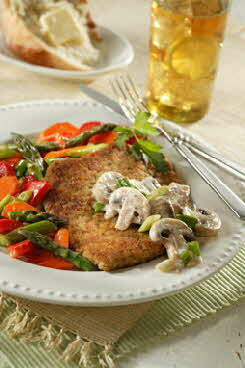 To serve, spoon mushroom cream sauce over pork chops. Make these chops to star in your family's next dinnertime production. Serve with sauteed mixed vegetables and good fresh bread.